Art and culture are a vibrant part of Chicago, especially in the Lincoln Park community. Murals, sculptures, and unique pieces of art can be found across the neighborhood, including along Clark Street in Lincoln Park. Now in it’s 6th year, the Art on Clark public art program, showcases local artists for an entire year to help beautify and enhance the local business corridor while adding to the rich history of art in the area. This year, the program features ten striking and eye-catching sculptures by local artists, and you can take a free self guided tour along the route to hear the history and inspiration behind each sculpture! Simply download the Otocast app from the App Store or the Google Play store and start your journey. Plus don’t forget to visit some of the savory restaurants, one-of-a-kind shops, and delightful bars along the way! 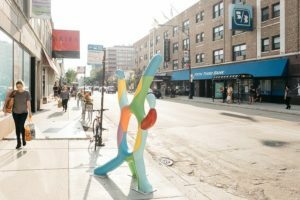 The Art on Clark sculpture tour will be on display through May 2019 and runs along Clark Street from Armitage to Diversey and on the south side of Diversey from Orchard to Lakeview. 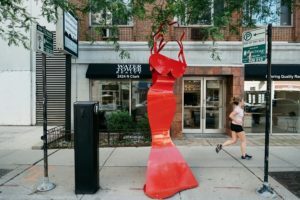 See the full list of sculptures below and be sure to make your way over to Clark Street in Lincoln Park to take the self guided tour with Otocast!